I’m sure most people have seen the 1980 film by Stanley Kubrick entitled, The Shining.The story, written by Stephen King, is a psychological thriller about a writer who takes his family to an isolated hotel to be the caretaker in the off season. It will also give Jack Torrance (played by Jack Nicholson) some much needed time to work on his new book. At one point in the movie, Jack’s wife begins to realize that things are getting a little weird and that is when she stumbles across his manuscript which is comprised of line after line, page after page of this sentence, All work and no play makes Jack a dull boy. Well things go down hill from and the insanity begins. Sometimes in our striving to be successful we lose site of those things that bring a sense of balance to our lives. We push ourselves to continuously do more, accomplish more, or be more. And in doing so, we never take the time to occasionally unplug our “work brains” so we can recharge the batteries and get re-balanced. As the year begins to wind down, we may wake up one day and realize that we are running out of time to accomplish some of the goals and objectives we wrote down at the beginning of the year. Add in a few holiday parties, Christmas or Thanksgiving with the relatives, and you are certain to get a bit off balance. So how can you tell you’ re out of balance? Here are a few signs. You would rather work late, than go home to be with your partner, spouse, or kids. You’re family is going on vacation … and you aren’t invited! You wake up at 2:30 AM and send an email to anyone for any reason. You have so much vacation time built up, that you could literally take 3 months off and not skip a paycheck. You walk in the house one day after work and your spouse asks “Who Are You?” It is only at that point that you realize you’ve walked into the wrong house! You home one day from a long business trip with a Teddy Bear for your little boy and find him upstairs in the bathroom … and he’s shaving! You have this sudden desire to start typing “All work and no play makes Jack, Tony, Susan, or any other name a dull boy or girl! You come home from work one day and find that your family has moved out … when you track them down they tell you they filed a missing person report for you because they actually moved three weeks ago! Okay so maybe you chuckled a bit. 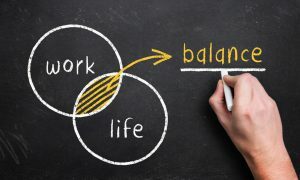 But on a more serious note you will be far more productive over the rest of the work year and have a better start to next year if you pause to get re-balanced and re-centered so you can focus on what is truly most valuable in your life. The truth is that there is no job, position, title, or amount of money, that can replace the your family, especially the short time you have with your kids. Sad thing is some people never get this until they lose them (physically or emotionally). Providing for your family is only half of the equation, spending quality time with them (especially during the stressful holiday season) is is the other half of the equation. Do what ever it takes to get re-balanced and stay balanced this holiday season!